PHILADELPHIA – More than three dozen CEOs and other top executives of some of the leading, best-known U.S. businesses publicly argued today that federal funding for basic scientific research is an investment in Americans’ prosperity, security and quality of life. The statement signed by 39 business leaders was published this morning as a full-page ad in the Wall Street Journal. 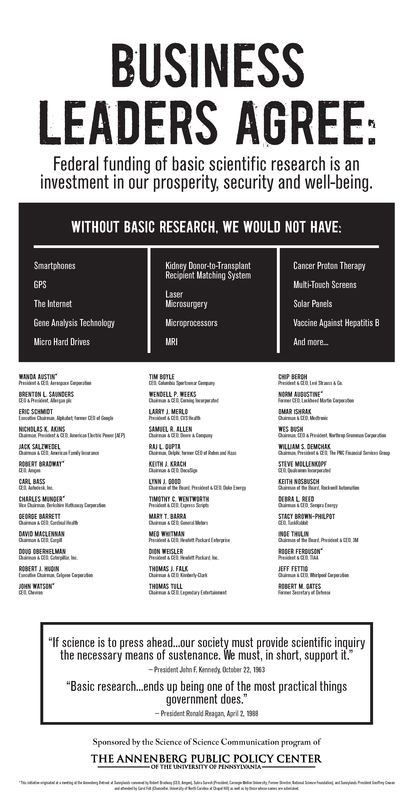 It also ran as a full-page ad in the New York Times on Monday, September 26.
Business leaders for basic scientific research ad. “Business leaders agree: Federal funding of basic scientific research is an investment in our prosperity, security, and well-being,” the group wrote. Without basic research, the ad said, we would be without some essential technologies that connect us, protect us and power our world. Without it, we would not the internet and smartphones, the hepatitis B vaccine and magnetic resonance imaging (MRI), solar panels, microprocessors, and the Global Positioning System (GPS). The signatories include Wanda Austin, president and CEO, Aerospace Corporation; Eric Schmidt, executive chairman, Alphabet, and former CEO of Google; Charles Munger, vice chairman, Berkshire Hathaway Corporation; John Watson, CEO, Chevron; Larry J. Merlo, president and CEO, CVS Health; Mary T. Barra, chairman and CEO, General Motors; Meg Whitman, president and CEO, Hewlett Packard Enterprise; Norm Augustine, former CEO, Lockheed Martin; Steve Mollenkopf, CEO, Qualcomm Incorporated; Thomas J. Falk, chairman and CEO, Kimberly-Clark; William S. Demchak, chairman, president and CEO, PNC Financial Services Group; Roger Ferguson, president and CEO, TIAA. The initiative emerged from a meeting at the Annenberg Retreat at Sunnylands in February 2016 that was convened by Robert Bradway, CEO of Amgen, and Subra Suresh, president of Carnegie Mellon University and a former director of the National Science Foundation. It was organized by Kathleen Hall Jamieson, program director of Sunnylands and director of the Annenberg Public Policy Center of the University of Pennsylvania. The ads are sponsored by the Annenberg Public Policy Center’s program in the Science of Science Communication. The participants in the retreat voiced concern that the importance of federal funding for basic scientific research not be lost in broader debates about budget priorities. Join the business leaders in expressing support: #FundBasicResearch. Support for basic research has led to many innovations, including the development of solar panels.